Gold Shoe Girl: A Little Birdie Told Me..
...that y'all might like to win something!!! So how about a one of a kind hand embroidered patchwork pillow cover!!! I was so blown away by the positive response to the kitten pillow that I whipped up something special just for you guys. 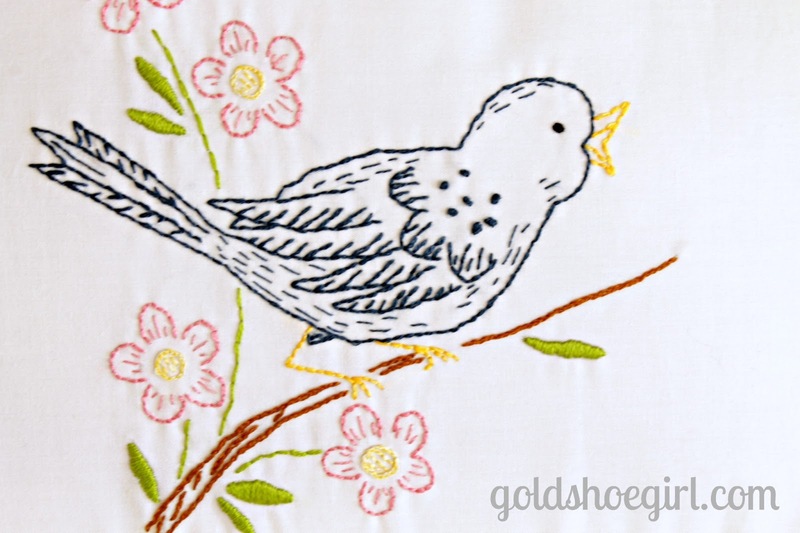 The bird was embroidered using a pattern from the internet. 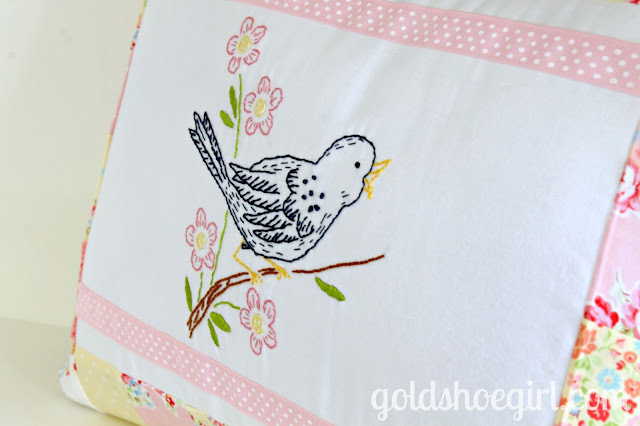 Just google vintage embroidery patterns and you will find a ton of freebies. Again the patchwork was made from my Lecien ancestral flowers stash and the white is Kona cotton. It also has a cute pink with white polka dots trim machine sewn on above and below the embroidery. The pillow cover fits a 12 x 16 insert which is not included. These pillows are so fast and fun to put together. I even started another one last night during Downton Abbey. 1. One entry just for leaving a comment. 2. An additional entry for leaving a comment telling me you're a subscriber or follower. 3. And another entry for leaving a comment letting me know you pinned a picture or shared this post on facebook. That's 3 chances to win!!! I'll use a random number generator to pick the winning comment next Monday. I'll email the winner so make sure I can find your email. Giveaway is open to my international friends but you are responsible for customs or whatever hoohah that entails. This is so pretty :):) I would love to win, thanks for the chance!! I follow your blog via email!! I literlly could KILL to win this one so please please pick me. I put this on Facebook and by Facebook name is Patricia Lemberger Lessell. I love vintage embroidery. I'm already sorry I got a nice sewing machine instead of a fancy machine with embroidery for my daughter. But then, you embroidered that by hand?? 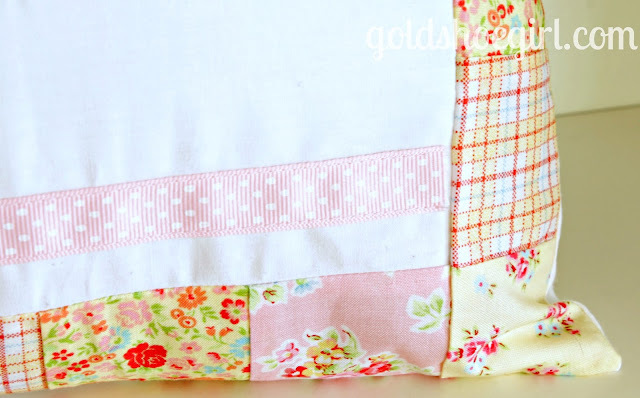 Beautiful and thank you for the awesome idea for an american girl doll quilt. You make it sound simple. That little birdie is so sweet and smart! 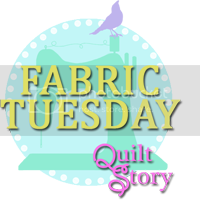 Your embroidery workmanship is excellent, and the fabrics you put with the designs are charming to set off the center just right! I started following you with the kitten pillow...just in time! Just pinned this pillow on Pinterest! I had already said "oooooooh!" when I first saw the bird, but having a chance to win it makes it even more delightful! I just pinned it to my "A Few of My Favorite Things" board! The embroidery is so cute! Thank you for the chance to win! This is precious and would go in my bedroom perfectly! Thanks for the chance to win this!! I'm a follower of your cute blog! I pinned this pillow to my Pinks!! g-daughters that are going to get a pillow with the embroidery on the front. Would love to win. Thanks for the chance to enter, I also am a follower. I am posting this on fb. Thanks for all your great ideas and help. I love the pillow!!! 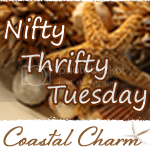 Such a wonderful giveaway - count me in!!! I subscribe to your blog via email. Thanks for the chance to win this awesome giveaway!! How sweet is that pillow!!!!!!!!! I can envision this little darling perched on the chair in my guest room. Thank you for this give away , love your blog. Love the pillow GSG !! Love the blog, I subscribed too. Would luv it. I found some patterns at Goodwill a few was ago. I want to make tea towels. This is sooooo adorable! Please include me in your giveaway! I am a new follower of your blog too! I love this pillow! Don't know if I'm eligible, but if I am, please count me in! Love it, love it, love it! 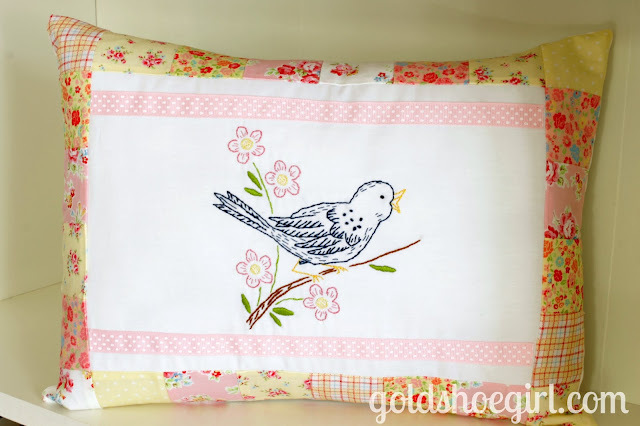 Would love a chance to win this beautiful pillow. Thanks for sharing. I really like your pillow, it reminds me of a hand embroidered pillow I gave my mother years ago. You've done it again! I am now a subscriber, and have downloaded this beautiful photo to my favorite embroidery board on interest! Pinned it to my embroidery board on Pinterest! I love the embroidery! I haven't done any in years. It inspires me to start a projest of my own. That is adorable! I could see that featured in my lawn chair this spring! I pinned it to "Products I love!" 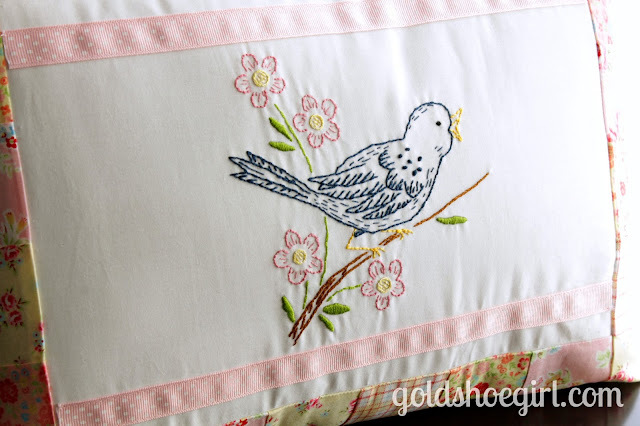 Such a pretty pillow cover / love all of the fabrics and colors and the embroidery is darling!